Carpet of weeds. It seems like they’re all emerging at once, as shown in this photo from Anastasia Kubinec with MAFRD. Early control significantly lowers the economic risk. Broadcasting live! Broadcast seeding comes with higher risks, but it covers a lot of acres fast. Got tips to share? TKO for TSW. We’re not saying seed weight isn’t important, but many other factors also influence plant population. Close the gap. To shorten canola maturity, you can swap varieties (in theory), up seeding rates, reduce nitrogen rates and seed shallow. 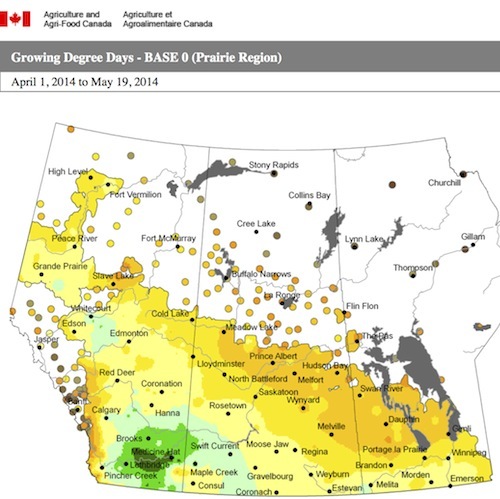 The AAFC map above shows accumulated growing degree days (GDDs) as of May 19. Click here to create your own AAFC weather maps. 1. Neil Harker, research scientist with AAFC in Lacombe, Alberta, says to provide “high yield protection” weed control should ideally occur before the ______ stage of the crop. 2. Integrated weed management uses various methods to keep weeds below economically-damaging levels. Of the following four points, three are proven principles of integrated weed management. Which one is NOT? 3. What is this weed? More growers may have skipped the pre-seed burnoff this year — given that weed emergence was delayed with the cool start to spring and because growers wanted to get seeding. But the weeds are coming. 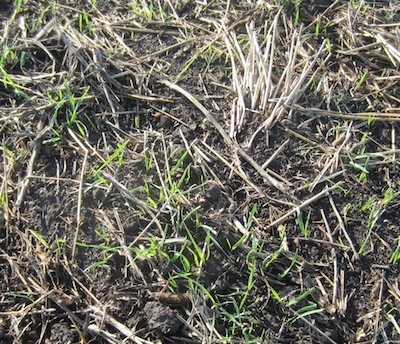 Warmer temperatures and good moisture have inspired emergence of “carpets” of weeds in some fields. These weeds will have a tremendous impact on canola yield potential and have to be controlled within the first week of emergence. If the risk that weather will prevent you from spraying right after emergence gives you shivers, you’ll want to spray now then seed. With an average seeding rate of 5 lb./ac., an average thousand seed weight (TSW) of 5 grams, and 50% seed survival rate, the result is only 5.2 plants per square foot. This doesn’t leave much margin for error — especially given the ideal target is 7 to 10 plants per square foot. Seed with a lighter TSW can improve your plant counts, but agronomy measures to improve seed survival can also make a big difference. Here are ways to increase seed survival and get more from a seed investment…. 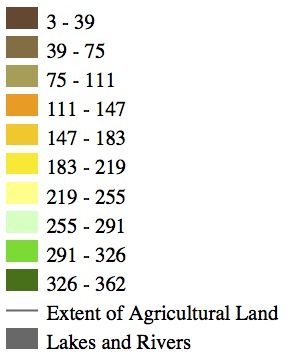 This graph shows that a higher seeding rate that will ensure a stand of at least 60 plants per square metre (6 per square foot) will mature a lot earlier than a stand with 20-40 per square metre. 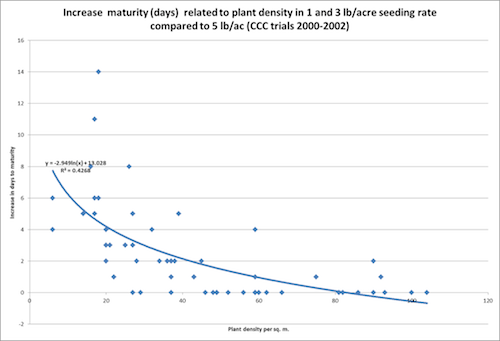 A higher seeding rate is just one way to reduce the days to maturity for a late seeded canola field. 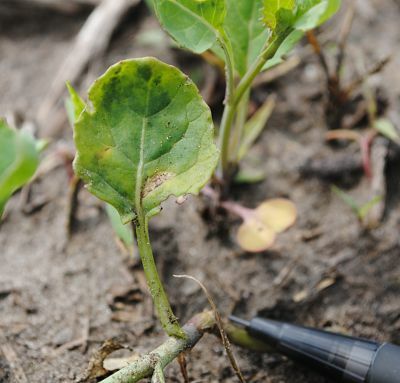 Growers face many weed, insect and disease management decisions throughout a growing season. In many cases, these applications provide a clear return on investment. In other cases, they do not. Here are a few examples where applications have a very low chance of providing a return. High cereal yields last year mean more residue issues this spring. If the drill cannot cut through or dig under the residue to place seed into soil, then some sort of residue management may be the lesser of two evils. We ran a survey the past two weeks asking Canola Watch readers for their thoughts on effective spring management for residue. Following are the detailed responses we received. Note that the opinions expressed are not necessarily those of the Canola Council of Canada and may not represent the best management practices…. The Canola Council of Canada’s Ultimate Canola Challenge will run trials at 15 sites across the Prairies, testing various crop input products currently on the market. The intent is to see if there is anything above and beyond the crop nutrition best management practices (BMPs) that will help growers increase yields and return on investment. It will help growers make informed decisions, and take some of the pressure off the “monkey throwing random darts” decision making technique currently required to decide which of these products to use.